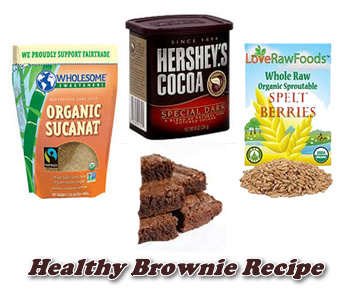 I just received this somewhat healthy brownie recipe from my dear friend Lori Petrick. You'll notice in the recipe instructions that Lori grinds her own spelt flour, which makes this a gluten free brownie recipe, too. That's a real plus for a lot of people these days who are on a restricted diet but still want to indulge in something really special from time to time. However, you don't HAVE to use spelt berries and mill your own flour. In fact, you don't have to use spelt at all. That part is completely flexible. To be honest, I don't know how Lori does it! Lori and her husband Mike have a unique ministry. They travel in a converted bus (think motor home on steroids) all around the US helping churches with visitation programs, revivals, summer camps and Bible clubs, etc. I've done a fair bit of traveling myself when Don and I were on deputation before heading to the mission field. It's no picnic, believe me! Don't get me wrong. It's wonderful and full of blessings to serve the Lord in this way, but it's not easy to reduce your life to what can be contained on 4 wheels and always be on the move. I guess that's why I'm so impressed that Lori takes the time and makes the effort to make healthy brownies and other healthy foods for her family. I'm also so pleased that she took a few minutes to share this particular healthy brownie recipe with us! Okay, yes. There is sugar in the recipe, so it may not be completely healthy, but all things considered, it's not too bad, especially if you don't eat the entire batch yourself! Otherwise, I like to call it "healthy-ish." Mix butter & sugar until well blended. Add eggs & vanilla, and stir till blended. Put all dry ingredients in: Add the flour first, then put other ingredients in on top and mix well. Pour into greased 9x9 square pan or double the batch/recipe & use a 9x13 pan. Bake for 18 minutes or until brownie sides start to pull away from pan.